Our 45ft telescopic water fed pole is constructed of High Modulus carbon fibre making these poles unbelievably rigid, lightweight and very strong. The 45ft telescopic pole is from our Evolution Pro + range of water fed poles. Thses poles are constructed from 100% high modulus carbon fibre making them unbelievably rigid, lightweight and very strong. Lateral style clamp lever arms. Smaller updated clamp design, now lighter and shorter compared to our previous clamps. Lots of room for the clamps to tighten over time. Clamps grip on sections really well, reduces the risk of sections spinning. 100% glueless clamps – easy to change in a matter of seconds. Each pole section has a stepped carbon area which stops the sections from being over extended during use. Reduces the risk of damaging the pole sections and clamps. Coloured markings on the end of each section. So as you extend the pole you get a visual warning and actual physical feedback that you have got to the end of each section, this helps to speed up the time it takes to extend our poles. You can still remove sections by loosening the clamp if needed. Our unique nylon base cap is inserted into the base section of the pole. Helps to protect the base of the pole and extends the life of the pole. Side exiting slot designed to allow the pole hose to freely move and will not damage the hose. Each base cap sits flush with the outer edge of the section, allowing you to add or remove extension sections if needed. Each pole comes with a clamp situated at the top of the smallest pole section, this is designed to clamp the brush head assembly to the pole. Allows you to easily swap over brushes or swap to using a goosneck with ease. We now offer a quick release angle adaptor, allowing you to quickly adjust the angle of the brush head. We also offer the choice or using different lengths of angle adaptors (3", 6" or 9") or 2 choices of carbon goosenecks (7" or 10"). We offer a range of extension sections designed to extend each water fed pole allowing the same pole to be extended to work at greater heights. Each Evolution extension section is 6ft long, giving you at least 5 foot extension to your existing pole. Each extension is made from our high quality carbon fibre material. You will need to make sure you are selecting the correct extension for your particular pole (click here to see our extension guide). You can keep adding sections to your pole (where available) to increase the height of the pole. We recommend having a quick release connector setup on your pole hose, so that it makes life easier when adding or removing extensions and feeding the hose through the extension. 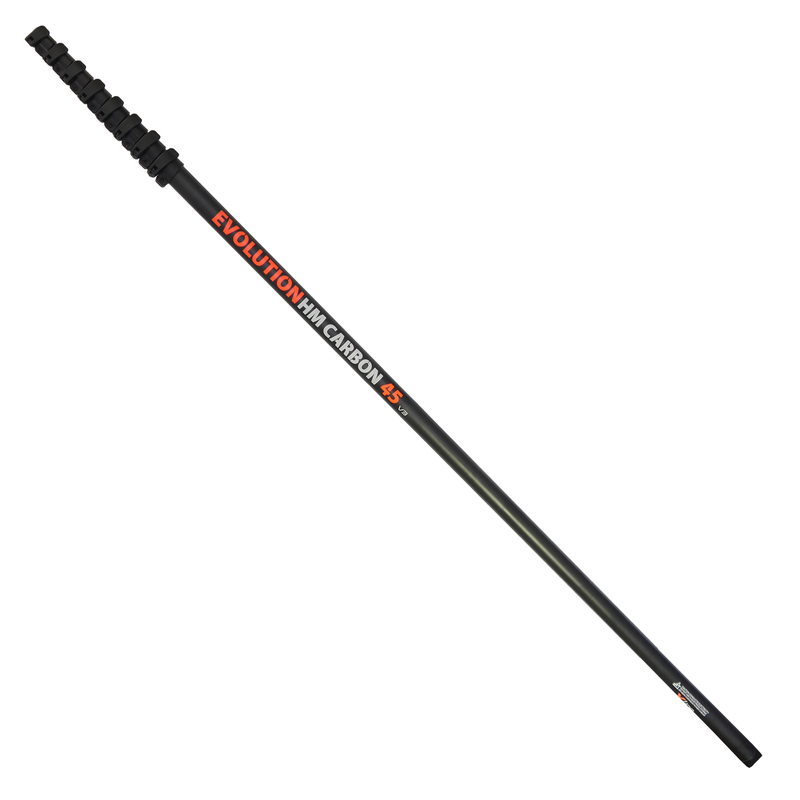 Each of our water fed poles comes complete with our 5mm orange braided pole hose. Our pole hose is designed so that it can be used with hot or cold water. This hose is constructed from 2 layers making it hard wearing and durable. We add nitrile to our hose making it softer and in the process easier to use and handle. You have the option of running this hose internally up through the inside of the pole, or externally (which will help to extend the life of the pole).